Day 3. Another day at Rio 2016 is over. Another day of disappointments for India though we came agonisingly close to their first medal. There were no world records, but in the pool, there were two Olympic records. Americans Ryan Murphy and Lilly King both set them in the 100m backstroke. In the 10m air rifle event, Narang failed to excite the crowd and withered down the order series after series. By the time the last series rolled around, Narang had himself too high a mountain to climb. After the final series, it was confirmed. Narang had failed to qualify and finished in 23rd place. Fortunately for him, he has two more events left to compete in. The 50m rifle and the 50m three-position. What can be said about Abhinav Bindra that hasn't already been said? It was a topsy-turvy qualification round. A real nerve wrecker for everyone at the venue and all those following the live scores on the Rio website. After a solid first three series, Bindra fell by the wayside in series four and five to find himself out of the top 10. Bindra scored 105.2 in the final series to make the final in 7th place. India's only individual gold medallist, Bindra was going for one final hurrah before his retirement. By the slightest of margins, he was edged out of the bronze medal and could only finish fourth. It was a tight shootout at the Olympic Shooting Centre that eliminated Bindra. The gold medal went to Nicolo Campriani of Italy with a score of 206.1. Ukraine's Serhiy Kulish bagged the silver with a score of 204.6, while Vladimir Maslennikov of Russia scored 184.2 to win bronze. The hall was packed to capacity and in Lane C was Abhinav Bindra. A 9.7 and a 10.2 on his 15th and 16th shots respectively was not enough to knock out Serhiy Kulish of Ukraine and they ended up in a tie. It went down to one shot to determine who would be eliminated. Bindra shot a 10, but Kulish responded with a 10.5 much to the heartbreak of many an Indian. So near but yet so far. 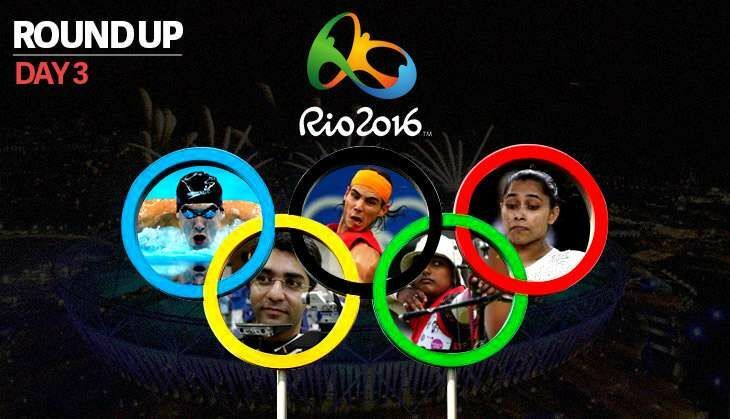 Abhinav Bindra may be India's most decorated shooter but his finished his last Olympics without a medal. The lowest ranked Indian after the initial rounds, Laxmirani Majhi, was the first to take part in the individual 1/32 elimination round. Majhi took on Slovakia's Alexandra Longova. Longova dominated her Indian opponent to win the match 7-1. Majhi's exit from the games was swift and just a day after the Indian archery trio lost a nail-biting thriller to Russia in the team event. Just as Abhinav Bindra was eliminated from the finals of the 10m air rifle event, India's Pool B match against Germany was in its dying minutes. It was the last three seconds of those minutes that cost India. They conceded a late goal to reigning double Olympic champions Germany to lose 2-1. Christopher Ruhr scored the winner for Germany. Indian swimmers, Shivani Kataria and Sajan Prakash, chosen through the University Rule, weren't expected to do well at the Games. They both finished second from bottom overall in their heats. Shivani finished 41st with a timing of 2:09.30 in the women's 200m freestyle heats. Sajan finished 28th in men's 200m butterfly with a timing of 1:59.37. That India had put up a spirited performance against Japan to level the match 2-2 wasn't a surprise, it was a heartwarming performance. That India ranked 13, went down 3-0 to seventh-ranked Great Britain wasn't a surprise either. India put up a valiant effort in the first half to keep the scores level at 0-0. Two quick goals in the second quarter was what undid the Indian defence and the morale of the team. India had a fair few chances in the final quarter but couldn't convert any to their advantage. The British outplayed the Indians in every aspect of the game. Martial artist Rafaela Silva won the host nations first gold medal. Silva won all five of her matches on Monday, 8 August, to romp home with the gold medal to loud screams from the crowd. "I hope my medal now will open the door for Brazil to win many more medals," Silva said after her win, according to the Associated Press. This is Brazil's second medal of the Games after Felipe Wu won a silver in the 10m air pistol event on Day 1. Rugby Sevens has debuted at the Olympics and the women's event just came to a close. It was a thrilling final between neighbours Australia and New Zealand. The Aussies outscored the Black Ferns four tries to three to win the tie 24-17 and became the sports first champions in 92 years. It was an emotional moment for everyone on the field as history beckoned the winners. Ultimately, New Zealand was outplayed. Maybe they can win in the men's event. Just maybe. The United States dominated in both men's and women's competition. Enough said. Monday saw the continuing feud between middle and long distance specialists Mack Horton of Australia and China's Sun Yang. It's known that Horton and Sun don't like each other. It's also known that each is backed up by their national federations and national media, each side wanting to add fuel to the fire. It reportedly started just ahead of the Games during a training session. Sun yelled at Horton and even splashed water. When asked later as to why he didn't respond, Horton said he "wasn't in the habit of responding to drug cheats". Sun had served a three-month suspension in 2014 for testing positive for banned heart drug Trimetazidine. After Sun lost to Horton in the 400m race on Saturday, 6 August, Horton referenced his drug history, to which Sun wept. There was a handshake at the podium that was all the jovial play between the two. "I just have a problem with athletes who tested positive and are still competing," Horton said. On Monday, Chinese officials asked Horton to retract and apologise. Chinese team leaderXu Qi went further and issued a personal attack on the Australian. "(He has) hurt the feelings between Chinese and Australia swimmers," Xu told Xinhua news agency. He added that Horton's behaviour displayed a "lack of good manners and upbringing". A second boxer has been arrested on sexual assault charges, Brazilian police officials said Monday. The arrest of boxer Jonas Junius of Namibia, came after a judicial order requested it on Sunday. On Monday, Junius was transferred to a maximum-security prison. The victim was Brazilian. Apparently, the boxer tried to "grab and kiss the cleaning lady". The arrest comes just two days after Moroccan boxer Hassan Saada was arrested on similar charges. Junius had carried the flag in Friday's opening ceremony.